Economical paper stencils with trendy designs for decorating for Halloween and Christmas. 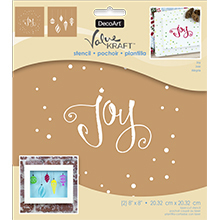 These heavyweight cardboard stencils can be used multiple times with paints and other mediums. Each package comes with one word art stencil and one iconic image stencil, making it easy to create your own unique decorations and party decor.